Definition: Employee Engagement refers to the emotional attachment an employee has with the organization. An employee is said to be highly engaged if he is fully absorbed or encouraged to perform his task beyond what typically is expected in his job role. Actively Disengaged Employees: This is the first category of employees, who are unhappy and resentful and spreads unhappiness in the organization. Such employees are bad for the organization since they are always provoking and convincing the other employees to leave their jobs and move out of the organization. However, these employees last longer in the firm and remove the prospective employees whom they perceive will attain higher position or move to the next job level in the near future. They do so, to get ahead in their jobs by removing the potential candidates. 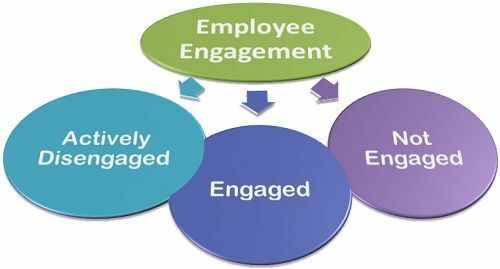 Engaged Employees: The engaged employees are those who work with full passion and are emotionally attached to the organization. They are innovative and provide new ideas to move the organization forward. Such employees are optimistic and spread positivity among the co-workers. They personalize the goals and objectives and always work for the betterment of the organization. Not Engaged Employees: This is the category in which majority of the employees in the organization fall. These are the ones who seek directions from their superior and do only that work which has been asked for. Such employees do put in their time, but not passion and energy into their work. They like to receive only one instruction at a time and lacks innovativeness. These employees can hold either a negative or positive attitude towards the organization. Thus, an employee can fall into either of these categories depending on his emotional attachment to the firm. The emotional attachment refers to the strong emotional bond employee shares with the organization.